Mr. Howell was admitted into The Phoenix Nursing and Rehabilitation Center on July 10th, 2018, from the Howard University hospital. He was admitted for rehabilitation of his broken legs, which he suffered while he was in Washington D.C. for a business meeting. He was on his way to the meeting when he approached a large amount of steps while carrying bags and luggage; unfortunately, he was in a rush and accidently fell down the stairs. Mr. Howells’ perception of the community was very positive from the very beginning. He was welcomed and greeted by staff, and he was extremely happy about how friendly the staff were. He was going through a lot of stress due to his injury, so the friendly staff were more than welcomed! Mr. Howell was eager to start the process so he could get back to work. He was also impressed on how clean the community was and liked how the community was under renovation. The community was also very convenient for him since he lives just a few blocks away. Mr. Howell met some of the staff from directors, nurses, housekeepers, social workers, and the concierges. He was very impressed by the concierge, Rafael Saldivia; they developed a great bond. Within the first 48 hours, Mr. Howell was already adjusted to his new room and was in the process of starting his rehabilitation. The goals of his care plan were to proceed with physical therapy on both legs, with different exercises and a lot of walking, so that he would be able to get the strength back into his legs. 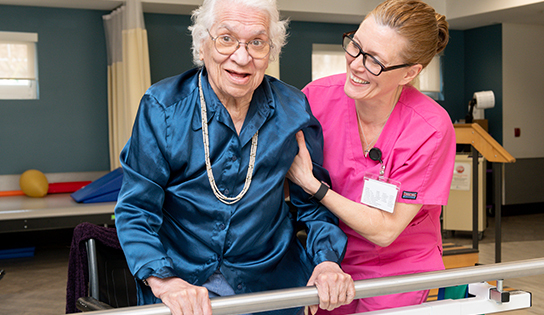 During a few weeks into his stay, he was beginning to see some strong improvement in his legs, he felt like the physical therapy was starting to truly help with his recovery. Mr. Howell had positive experiences at the community. He attended recreational activities such as concerts, painting events, and also attended a Yankee game that the Phoenix community went to as a family! The concierge devoted his time in checking up on Mr. Howell. They played board games such as chess, checkers, and they would also do a lot of talking about each other’s personal life. This relationship meant a lot to both Mr. Howell and our concierge. Mr. Howell was an entrepreneur who had his own business, which he was very passionate about. After staying at The Phoenix for a few months, his time at The Phoenix was coming to an successful end. Mr. Howell was able to obtain in-home healthcare with a home attendant, which will be at his place of residence. His discharge date was set on October 15th, 2018. It was a pleasure having Mr. Howell at our community. He was always happy, respectful, positive, and always in overall great spirits. We wish him nothing but success and great health!